FRANKFORT, Ky. (Aug. 1, 2016) — Kentucky Governor Matt Bevin declared August Kentucky Breastfeeding Month. Kentucky ranks 42 out of 50 for breastfeeding rates in the United States, well behind the Center for Disease Control and Prevention’s Healthy People 2020 objectives. The proclamation, signed at the capitol in Frankfort, is a step in the effort to improve that ranking. It acknowledges the importance of creating a healthy environment for children; the benefits in growth, development, bonding and disease protection provided by breast milk; and the support needed from Kentucky’s employers for breastfeeding mothers that will benefit both the employee and the company. To read the full proclamation, visit www.breastfeedKentucky.com. The proclamation was inspired by the passage of Senate Concurrent Resolution 9 during the 2016 legislative session. SCR 9 was introduced by Sen. Reginald Thomas, D-Lexington, with the support of the Lactation Improvement Network of Kentucky (LINK). It calls upon lawmakers to wholeheartedly support breastfeeding among the state’s family. In addition to SCR 9, LINK and Sen. Thomas also worked together on Senate Bill 34 which creates a fine for anyone who impedes a mother’s right to breastfeed in any public or private facility in the state. The efforts fighting for this legislation and others that protect a nursing mother’s rights will continue in the 2017 session. As part of the month long celebration, events educating the public about the benefits of breastfeeding and offering support to breastfeeding mothers are taking place across the state. These include the Louisville community breastfeeding celebration Aug. 5 at the Family Health Center on E. Broadway, the Big Latch On Aug. 6 in Bowling Green, Elizabethtown, Lexington, Ashland and northern Kentucky and the rock and relax area at the Kentucky State Fair Aug. 18 through 28. For a complete list and more information, visit www.breastfeedKentucky.com. Founded in 2011 by a group of mothers and breastfeeding advocates, the Lactation Improvement Network of Kentucky (LINK) aims to improve the health and well-being of all babies by connecting women looking for breastfeeding resources and information. It is recognized by the United States Breastfeeding Committee as Kentucky’s breastfeeding coalition. LINK is a group of volunteers from across Kentucky leading the effort in breaking down breastfeeding barriers on the local, regional and state levels. This includes advocating for laws that protect a mother’s right to breastfeed in public or express breast milk in the workplace; promoting dialogue with minority communities with the lowest rates of breastfeeding; and recognizing community members who further the mission of making breastfeeding easier for all Kentuckians. For more information, follow LINK on Facebook or visit www.BreastfeedKentucky.com. The 2016 General Assembly of the Kentucky Legislature is underway! We need your help RIGHT AWAY to help support breastfeeding legislation! SCR 9 is a Concurrent Resolution of the Senate and House, recognizing the importance of removing barriers to breastfeeding in the Commonwealth. If passed, the resolution is a statement by the legislature recognizing the importance of breastfeeding. This resolution could go a long way towards helping establish better breastfeeding laws, workplace laws, and more! Read the whole resolution and follow it’s progress at http://www.lrc.ky.gov/record/16RS/SCR9.htm. The Resolution will be considered by the Senate Health and Welfare Committee on WEDNESDAY JANUARY 20 at 10 am at the Capitol Annex in Frankfort. We need your help TODAY to support this Resolution! 1. Call the legislative message line at 1-800-372-7181. An operator will pick up, and you can ask for him or her to communicate to all members of the Senate Health and Welfare committee your support for SCR 9. 2. Call your own State Senator. You can find that person at http://www.lrc.ky.gov/Find%20Your%20Legislator/Find%20Your%20Legislator.html. Tell your Senator, or an aide, your story of why breastfeeding is important. It is especially helpful if you can share a story of how your experience was difficult or unsupported by employers, healthcare providers, childcare workers, businesses, or the general public. 3. If you have an experience that you are passionate to share, please consider making a short presentation at the Committee Hearing on January 20. Contact Cerise at breastfeedinglink@gmail.com by January 15. 4. Attend the Committee Hearing on January 20 at 10 am in Frankfort. Bring your entire family! Contact Cerise at breastfeedinglink@gmail.com to let us know you’re coming. We will send out details on the exact location for the meeting at the Capitol Annex as soon as we have them confirmed. The only way this will be passed is if YOU help show your support and spread the word! Please share this post, tell your colleagues, family members, and friends, and most importantly, contact your legislators! Thanks for your support in making it easier for Kentuckians to breastfeed! This conference is designed for all health professionals who work with mothers and their newborns antenatally and during the intrapartum and postpartum periods in the NICU or well nursery, i.e. OB & NICU & postpartum nurses, lactation consultants, pediatric nurses, midwives, home visiting nurses, doulas, OTs, PT, dieticians, childbirth educators and physicians. For additional information visit the United States Institute for Kangaroo Care website. Please show your support for two proposed breastfeeding laws that are up for review in the current legislative session! Senate Bill 35 attaches penalties to violating a mother’s right to breastfeed, and Senate Bill 36 provides increased protections for Kentucky mothers to express milk in the workplace. Call 1-800-372-7181 to leave a message of support for all Kentucky legislators, or find phone numbers for the elected officials that represent you at www.lrc.ky.gov. Email BreastfeedingLINK@gmail.com with your stories of discrimination in public or difficulty in the workplace. We need these stories to educate legislators as to why these protections are needed in Kentucky. Like the LINK Facebook page or follow us on Twitter to get regular, real-time updates. Share with your social network or clients! We need Kentucky’s legislators to know that citizens want this protection! Subscribe to the LINK newsletter to easily receive and share calls to action through your professional network. Use the talking points below in discussions with your legislators, in presentations or to hand out to clients. 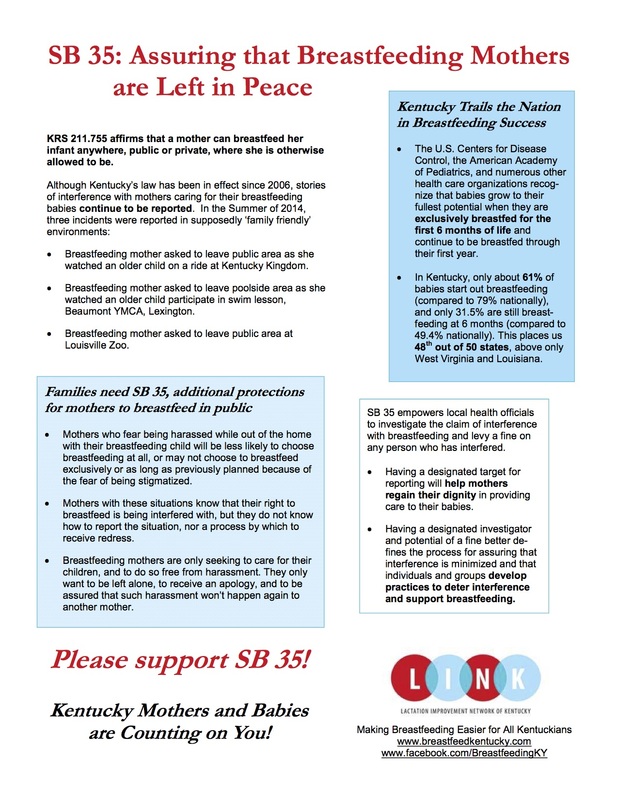 These two protections for Kentucky families further LINK’s mission to make breastfeeding easier for ALL Kentuckians. Please show your support by picking up the phone, sharing your stories and encouraging others to do the same. Space is limited to 100. Doors open at 7:00 am. Applications have been made for CERPs and CEUs. Attendance certificate, CERPs and CEUs are provided by KLIC via email after the conference. Parking is available in the garage adjacent to the CTR Building and accessed from South Clay Street. Cost for parking is $8.00/day. Dr. Bergman’s books and tapes will be available for purchase with cash or check. Handouts will be provided via email or on the LINK website as soon as available. Nursing babies are welcome and accomodations for pumping will be made upon request. Nils Bergman, MB ChB, DCH, MPH, MD is known world wide for his contributions to Kangaroo Mother Care (KMC), and the underlying perinatal and developmental neuroscience behind it. His diverse background explains his broader public health approach to supporting and promoting the global dissemination of maternal-infant skin-to-skin contact. He, together with Midwife Agneta Jurisoo, developed and implemented KMC for premature infants right from birth. This resulted in a five-fold improvement in survival of Very Low Birth Weight babies. He introduced KMC to South Africa in 1995, and after 5 years, KMC became official policy for care of prematures in the hospitals of the Western Cape province. During that time he was the Senior Medical Superintendent of the Mowbray Maternity Hospital (7000 deliveries per year) and five Midwife Obstetric Units (11000 deliveries per year). Dr Bergman continues to live and work in Cape Town, as a Consulting Public Health Physician. He has also worked in Sweden and Zimbabwe. He is an Honorary Research Associate at the University of Cape Town, South Africa where he continues his research on KMC and travels extensively to share his passion and research evidence for KMC. He is married to Jill and together they have 3 children. Jill Bergman, BA has taught and lectured in Zimbabwe and South Africa. She has supported her husband, Dr. Nils Bergman, in Kangaroo Mother Care since 1988. Together they have produced 4 DVDs and written a book “Hold Your Prem” for parents of premature babies. She trains nursing staff in the practicalities of KMC and developmental care, is a doula and a kangaroula. Kentucky Ranks 6th Highest for Birth Kangaroo Care! 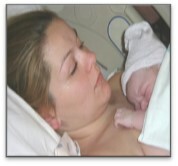 According to the newly released mPINC Survey results from 2013, Kentucky ranks 6th highest for Skin-to-Skin contact or birth Kangaroo Care by placing newborns in KC with their mothers immediately after birth, with nothing between them except a diaper, providing uninterrupted time for breastfeeding to begin naturally in the delivery room. The mPINC Survey is conducted every two years by the Center for Disease Control (CDC) to collect data from birthing hospitals nationwide on maternity care practices and policies related to breastfeeding support. Kentucky also ranks 12th highest for birth KC for mothers delivering their babies by C-section. Forty-four KY birthing hospitals completed the 2013 survey. Skin-to-skin contact for vaginal and c-section births are just 2 of the many questions in the mPINC survey. All of the questions gather information about the hospital practices that can either support or hinder a mother in her decision to breastfeed her baby. In a sense, the mPINC survey measures how “baby friendly” the birthing hospital is. LINK congratulates the Commonwealth of Kentucky in achieving such a great improvement in supporting breastfeeding in our birthing hospitals! 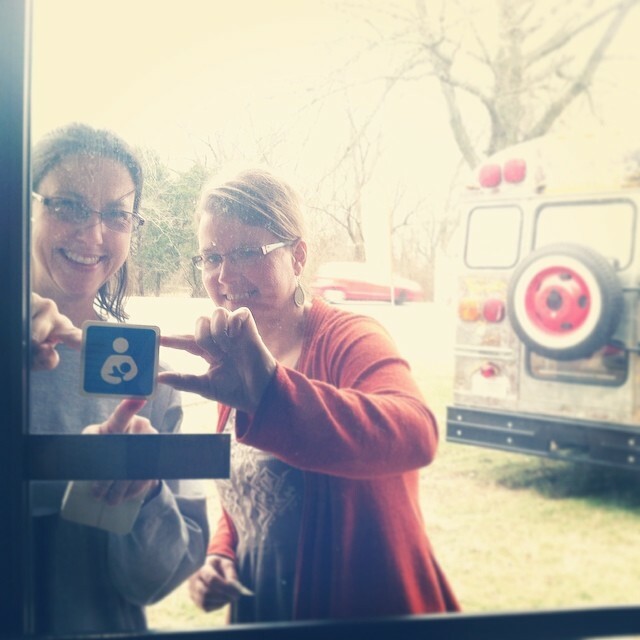 Dana Bennett and Michelle Johnson-Howell place the International Breastfeeding Logo on the doors of local businesses. A farmer, a mother-to-be, a registered nurse and two public health workers walk into a bar, a coffee bar that is. This is not the start to another bad joke, but just a day in the life of some Western Kentucky Breastfeeding Coalition members and friends. This is Bowling Green’s very own league of breastfeeding advocates working together to promote a harmonious balance with mom, baby, breast and everyone else. This is the modern story of Farm to Table, where at times the table just happens to be the breast. BG’s breastfeeding efforts paralleled the realm of local foods for so long that it only seemed natural to combine the two. The Community Farmers Market, with the help of local farmer, mother, food advocate, entrepreneur and breastfeeding supporter, Michelle Howell, served as the springboard for the idea. This farmers market features local foods and one cannot get any more local than breastfeeding! This year-round farmers market does more than just sell anything a small farm can grow. It has booths for local crafters and artisans, promotes community involvement and helped grow the idea of Babynet KY.
Babynet KY is currently housed on a Facebook platform and serves as a forum for local parents and parents-to-be. Dana Bennett, local dietitian, breastfeeding promoter, crafter and farmers market supporter, is one of the few that moderates the page. Members are free to post any questions, comments or concerns about anything baby. Discussion is encouraged and often unavoidable. This social media tool keeps the area connected and provides parents with much needed information and resources that are often overlooked in official publication. Babynet KY members are invited to meet once a month with other members and hear about what hot topics are on the rise in the community. Speakers, including LINK’s very own Cerise Bouchard, are featured at meetings to broadcast what is happening in new areas of breastfeeding promotion, birth stories, babywearing and many other topics seen daily on the Facebook page. Just this month, efforts from famers market advocates and Babynet KY members combined can be seen in a local publication, EAT. Spring/Summer EAT publication with breastfeeding photo shoot. EAT is created and published locally and printed twice a year to promote local foods, farming and sustainability. Gracing the pages of the latest issue is a wonderful full-page spread featuring breastfeeding mothers at a local coffee bar. A local photographer donated time to do a tasteful photo shoot empowering breastfeeding women in a local establishment. 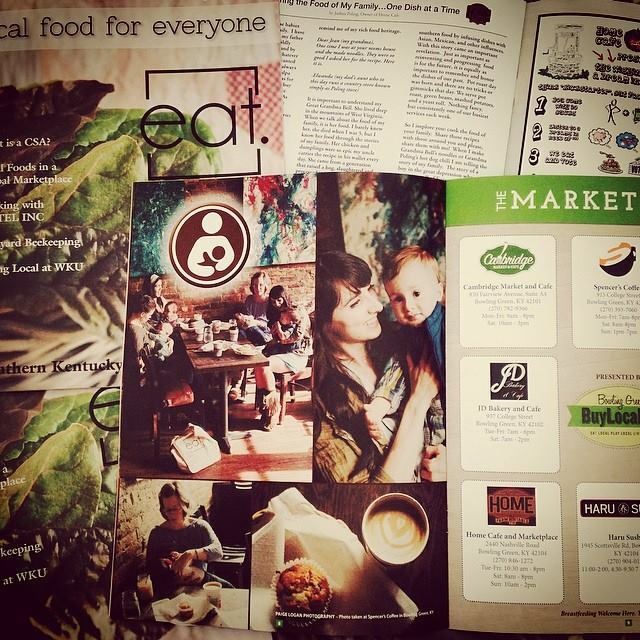 The adjacent page lists nine local food establishments that promote and encourage breastfeeding. These nine local supporters were the first to proudly display the international breastfeeding symbol in their storefront windows as a beacon of hope and comfort for breastfeeding women and the cause. Window decals provided by the group will be creeping up across BG as more and more support is gained through community-wide promotion. So, from the Community Farmers Market to Babynet KY to the biannual publication of EAT magazine, the women at today’s coffee bar are walking door-to-door to pass out the publication. The featured advertisement serves as a reminder for the community that breastfeeding is an important local effort that we must sustain. It reminds mothers that they do have the power and the support to breastfeeding anywhere they decide to go in their community, and it reminds this wonderful group of women that their efforts are helping to create a shift. This local shift is looked upon proudly by LINK and its supporters. It helps shine a light on the vision that soon a culture of support for breastfeeding will be the norm in Kentucky.